Name: Professor Bernice 'Benny' Summerfield. Time of Origin: 26th Century. 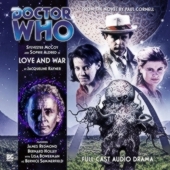 Appearances: "Love and War" -"Birthright", "Blood Heat" - "Happy Endings", "Return of the Living Dad", "Eternity Weeps", "The Dying Days" and "The Shadow of the Scourge". Doctor: Seventh Doctor and Eighth Doctor. History: Benny originally met up with the Seventh Doctor and Ace when he visited the planet Heaven, quite literally that for humans and Draconians, while The Doctor was 'apparently' getting a book out of the local library. However, it was revealed that he was actually attempting to stop a race called the Hoothi, who killed several people and used their bodies as soldiers, even Ace's boyfriend Jan. The Doctor defeated them, but Ace decided to leave him, angry that he only tried to take Jan away from her because he was jealous. Benny, although angry at what The Doctor did, knows he could have done nothing else, and agrees to travel with him for a time. Benny, although not actually a professor, was an archaeologist, and did a very good job of it as well. However, like The Doctor's future companion, Fitz Kreiner, she had a bad habit - Fitz smoked, Benny drank. The Doctor was known to try to get her off the booze, but eventually gave up. Of course, The Doctor still cared for Benny, just as much as he did for all his other companions. Benny never really went in for hugging much, as she mentioned a few times, but she always enjoyed a good laugh. She and The Doctor did get on, but the whole thing was partly helped along when Ace rejoined The Doctor after she'd been away for three years - The Doctor influenced Ace to leave him so she could eventually return and help him drive out an infection that had gotten into the TARDIS in "Cats Cradle: Witch Mark". Benny had some of the most interesting meetings with people in her time with The Doctor, including Sherlock Holmes and Doctor Watson in "All-Consuming Fire", a book that, although written by Arthur Conan Doyle in that Universe, was only written for Watson's benefit, and thus never saw print officially. She also returned to Peladon, a planet visited twice by the Third Doctor in "The Curse of Peladon" and "The Monster of Peladon". She also had a battle with a new version of The Master, created when a race called The Tzun gave him new nanites that restored to him his ability to regenerate. These probably weren't as effective as had been previously thought, given that he attempted to lengthen his life again in his later appearances, but they did work for a brief while. She was also one of the first companions to deal with a situation without aid from The Doctor, being only helped by Ace while The Doctor battled the Cybermen in another time when the TARDIS's Time Vector Generator was removed, thus reverting the TARDIS interior to a simple Police Box, and Ace and Benny tried to recover the TVG from a man attempting to unleash an alien race called the Charrl from Earth's far future ("Birthright"), while The Doctor, in the TARDIS escape pod, battled the Cybermen in 2006.("Iceberg"). Some time after this, Ace left for the second time, and once again, it was just The Doctor and Benny. Some rather interesting events occurred in this second period with just The Doctor and Benny, on of the most interest being when The Doctor, in order to help Benny grieve for the death of a friend, briefly turned himself into a human called Dr John Smith. ("Human Nature"). However, this wasn't as successful as it could have been, since the resulting situation had an alien race attempt to acquire The Doctor's biodata, in order so that they could defeat the Time Lords. You see, each of the aliens could only reproduce eight times in any life. However, each time they regenerated, they could breed again, each of the resulting children would also be able to regenerate, and Gallifrey would eventually be overpowered by sheer force of numbers. Smith, when he got involved in the conflict, he was tempted to leave them and marry his fiancé, (Yes, his fiancé!) but an aspect of the TARDIS locked away in his mind taught him a vital lesson - whether Dr John Smith or The Doctor, he is never cruel nor cowardly, and is a man of peace even in a time of war. He thus turned himself back into The Doctor, and defeated the aliens. It was in the next story, "Original Sin", that The Doctor and Benny met up with two new companions, Chris Cwej and Roslyn 'Roz' Forrester. After this, things began to get even more interesting for The Doctor and friends, particularly an occasion when they battled The Doctor's fictional counterpart, Dr Who, freed from the Land of Fiction. It was some time after this that Benny left The Doctor, when a young man she'd met, Jason Kane, proposed to her, and she accepted, in "Death and Diplomacy". Their wedding was the main focus in the following story "Happy Endings", although other minor problems included The Master having stolen the sacred Loom of Rassilon's Mouse, causing several Fortean flickers, temporal anomalies which displace events and objects from their proper positions in space and time, including The Doctor's original Type Forty TARDIS, thought to have been destroyed when The Doctor destroyed an alternate timeline created by The Meddling Monk, and had since been going around in that timeline's Third Doctor's TARDIS, since that Doctor was dead. The Doctor, Chris, Roz and Benny dealt with it with some help from Chris' new girlfriend, Ishtar, the former Timewyrm, and The Brigadier. Benny later appeared in the novel "Return of the Living Dad", when Benny discovered that her father, thought to have been killed by the Daleks, but actually trapped in 1983 helping aliens that were stranded on Earth, some of them trapped by The Doctor. In the process, the TARDIS and Jason were captured by a fifties greaser called Albinex, who was attempting to acquire the nuclear codes of the missiles that the Fourth Doctor disabled in "Robot", and used a woman out of phase with time to try to make The Doctor say the destructor codes, but she couldn't read them in his past, because the ghost of the Sixth Doctor was still angry at the Seventh for cutting his life short and would let nobody go to a point before The Doctor's last regeneration, and couldn't make him tell her by showing him his next regeneration, until she increased his greatest moment of pleasure a million times, and he gave her the codes. The Doctor discovered, to his horror, that Issac was intending to move Earth into a military era so that the Dalek attack in the 22nd century ("The Dalek Invasion of Earth") could be fought off. Or so he thought. Actually, Albinex was helping the Daleks, and trying to damage Earth so badly that they could invade two whole centuries ahead of schedule! However, The Doctor managed to fight off Albinex and, although a missile was fired, they diverted it to hit the Dalek satellite placed to monitor Albinex's plan. Benny returned again in the story "Eternity Weeps", when she and Jason, in 2003, were attempting to find what was thought to be Noah's Ark, although Benny was on the team that would be using just scientific methods to find the Ark, and Jason's team would be using both religious and scientific methods to find it. They did well at first, but when both expeditions were attacked, they were forced to summon The Doctor and Chris. In the process the four of them, along with The Doctor's old friend Liz Shaw, discovered that an alien terraforming virus had been unleashed into the atmosphere, and, worst of all for them personally, a virus was replacing the water in Liz's body with sulphuric acid, which killed her, and the entire thing was caused by Jason going back in time to try to stop the situation! Eventually, The Doctor managed to save the world, but in doing so he was forced to kill off a tenth of Earth's population. Benny and Jason, no longer able to live with each other, divorced, and The Doctor and Chris took her back home. In Benny's last meeting with The Doctor, she'd been sent back in time by Kadiatu Lethbridge-Stewart to The Doctor's house in Allen Road. However, not only was The Doctor a week late, but he'd regenerated into the Eighth Doctor, and had probably recently left Sam at the Greenpeace rally I mentioned in my guide on her. Also, as if that wasn't bad enough, an attack from The Doctor's old enemies, the Ice Warriors, because humanity had landed on the tombs of the Martian warlords. In the battle against the Ice Warriors, aided by the Brigadier, The Doctor was apparently killed by a deadly intelligent gas cloud, and Benny and the Brigadier were forced to face off with the Martians alone. However, The Doctor had survived the Red Death by shutting down his body briefly, and later managed to trick the Martians into putting themselves into a position where they could be destroyed. He then took Benny back to the 26th century, and gave her Wolsey for company. It can only be hoped that Benny did well back in her own time.